He may be the most reviled figure of the 20th century, yet that hasn’t stopped people constantly comparing politicians to Adolf Hitler. Here are just five occasions the media got in on the act and depicted political leaders as the German dictator. In his brief political career, the US president has already attracted numerous comparisons with the leader of the Nazi Party. While the majority of these have come on social media some newspapers and magazines have also drawn parallels. 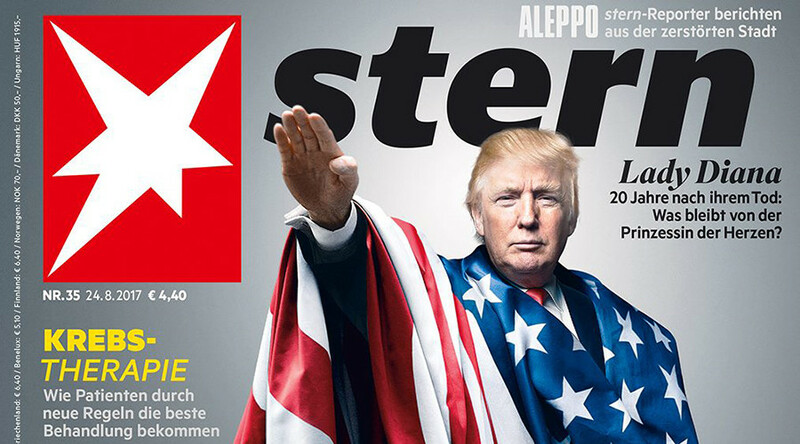 The most recent example came this week when German news magazine Stern put an image of Trump, draped in an American flag, with his arm raised in a Nazi salute. The image was accompanied by the headline “Sein Kampf”, meaning ‘His struggle’, a nod to Hitler’s manifesto ‘Mein Kampf’. The center said it had also been vocal in criticizing Trump for failing to make a distinction between Nazis and KKK protesters and those who opposed them. “Germans must surely know that by misappropriating'' Nazi symbols “they belittle and becloud'' past crimes. However, Stern isn’t the first publication to depict Trump as Hitler. In December 2015, before Trump had even secured the Republican presidential nomination, the Philadelphia Daily News used a photo of the real estate magnate with his arm raised to look like a Nazi salute. The front-page headline read “The new furor”, a pun on the German word führer (leader).The front page was a reaction to Trump proposing a ban on all Muslim immigrants and tourists from entering the US. The front page was a reaction to Trump proposing a ban on all Muslim immigrants and tourists from entering the US. Turkish tabloid Gunes took a particularly aggressive approach when it chose to portray Angela Merkel as Hitler in March. In the front page splash, a pursed-lipped Merkel, complete with Hitler mustache, is seen toting a pistol and wearing a Nazi uniform. The paper, which supports Turkey's ruling AKP party, branded Merkel “Mrs. Hitler” and an “ugly aunt,” while accusing her of being the leader of “fascists” and of inciting anti-Turkish sentiment throughout Europe, especially in Austria, the Netherlands and Belgium. The front page came after a war of words between Ankara and several European Union countries in the run up to April's constitutional referendum in Turkey, which granted President Recep Tayyip Erdogan more extensive powers. Erdogan himself hasn’t been immune to the Hitler comparisons. In fact that was the subject of a book by Turkish author Ergun Poyraz titled ‘Takunyalı Führer’. The book, which was published in 2010, is one in a series of political books by Poyraz which gives his analysis of Turkey’s ruling classes. Poyraz was arrested in 2007 and accused of being part of Ergenekon, an alleged clandestine organization. In 2013, he was sentenced to 29 years in prison for plotting against the Turkish government as part of the Ergenekon trials. Hundreds of high profile Turks, including military officers, journalists, and opposition lawmakers, were imprisoned during the trials. Hungarian leader Orban got the Hitler treatment on the cover of liberal Hungarian magazine Magyar Narancs in September 2015 over his decision to erect a fence along the Serbian-Hungarian border in order to impede the movement of migrants into Hungary. Again the front page designers decided to add a Hitleresque mustache to a photo of the politician’s face, however, in this case, they chose to use barbed fencing to evoke Hitler’s signature look. Serbian tabloid Blic went for a similar approach. They used the words “Orbane sramotó” (Orban, this shame) to create the moustache. The rest of the front page labeled Orban a “wicked neighbor” and alleged that Hungarians who helped refugees got in trouble with the police. Orban drew the ire of Hungarian Jews last month when he praised Miklos Horthy, who served as Regent of the Kingdom of Hungary from 1920 to 1944. Orban had branded Horthy an “exceptional statesman,” but Jewish leaders said he was a Hitler ally who oversaw the murder of more than 500,000 Holocaust victims. Orban later apologized for the comments. 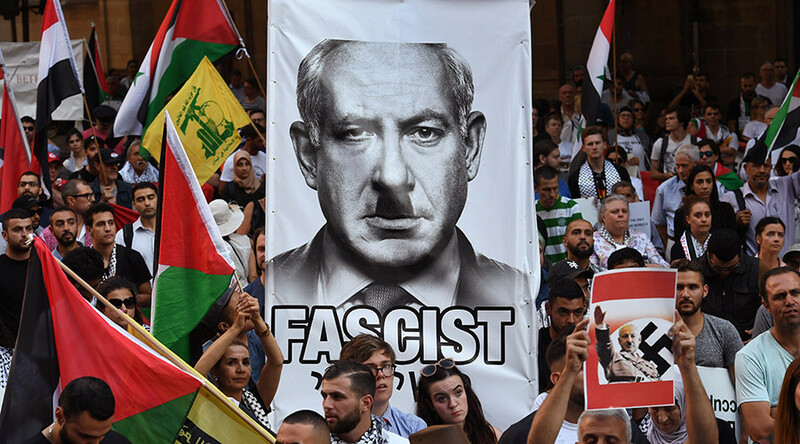 During a state visit to Australia earlier this year, Netanyahu was met by a crowd of pro-Palestinian protesters carrying a poster depicting him as Adolf Hitler. Around 650 pro-Palestinian demonstrators gathered in Sydney to protest Netanyahu’s visit, which was the first from a serving Israeli premier to Australia. A large poster of Netanyahu with a Hitler mustache and the word “Fascist” generated considerable media attention at the time. The Jerusalem Post reported that others in the crowd carried placards branding Netanyahu a ‘war criminal’ and ‘terrorist’. The demonstrators also lambasted the Australian government for its strong ties to Israel.